Mumbai(PTI): Shashi Kapoor's family members including nephew Rishi, grand-nephew Ranbir and other Bollywood celebrities like Amitabh Bachchan today expressed happiness over the veteran actor's Dadasaheb Phalke honour. Kapoor was today presented the award at the landmark Prithvi Theatre here by Union Information and Broadcasting Minister Arun Jaitley. The 77-year-old actor could not travel to New Delhi because of his ill-health when the award ceremony was held in Delhi on May 3. Several members of the Kapoor family, including late Raj Kapoor's wife Krishna Raj Kapoor, Shammi Kapoor's wife Neila Devi, Neetu Kapoor, Babita, Shashi Kapoor's son Kunal and daughter Sanjana were present on the occasion. 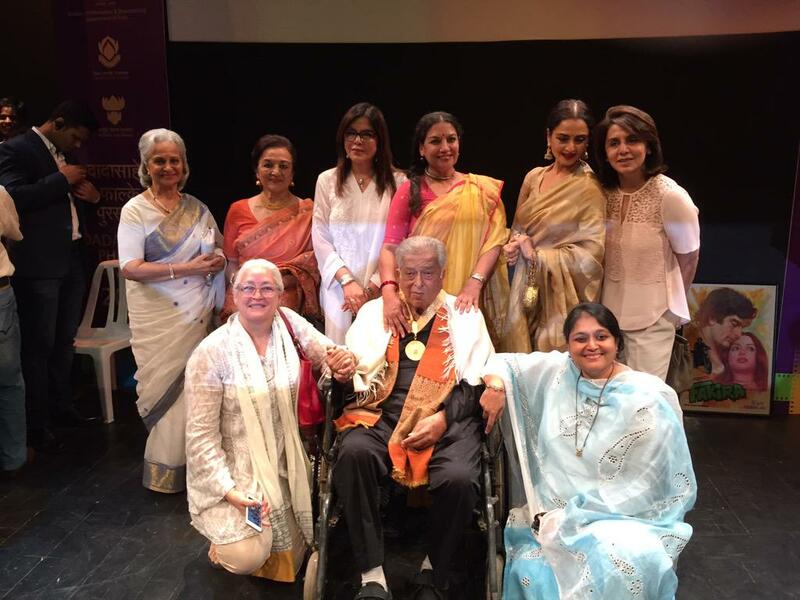 Kapoor's co-stars Waheeda Rehman, Hema Malini, Asha Parekh and Zeenat Aman also attended the event. Rishi Kapoor said, "We are thankful to the government for conferring this award on Shashi Kapoor. It's the third time in our Kapoor family that we are getting this award. I am happy that I got the opportunity to act with him and to be directed by him. He is the only director who used stick on the sets," the noted actor said. Amitabh Bachchan, who starred with Kapoor in blockbusters like Deewar, Kala Patthar and Kabhie Kabhie said, "Prithvi Theatre is a wonderful place to honour him. I had the privilege to work with him in films... he is very caring, compassionate, generous person...keep going." #DadaSahebPhalke Award: #ShashiKapoor is the 3rd person to receive the prestigious award from the same family. Noted actress Shabana Azmi, who was also present on the occasion, said, "Honouring Shashi Kapoor means we are honouring ourselves. He is our treasure. He is the first actor who entered Hollywood many years ago. He is a great actor." Ranbir Kapoor said, "It's a big day for us. He truly deserves Dadasaheb Phalke Award. He has done great work." Actress Karisma Kapoor and younger sister Kareena's husband Saif Ali Khan too seemed happy with the honour Kapoor received today. "His contribution to cinema is incredible. He has acted in commercial, alternate and even international cinema, which is great. In the 60s he did path breaking work... he is the maker of modern Indian cinema," Saif said. Karisma said, "It's a great feeling. He deserves it and we are happy he got it." Kapoor, son of legendary actor-filmmaker Prithviraj Kapoor, started his film career as child artist. His notable films include Aag, Aawara, Samadhi, Dharamputra, Jab Jab Phool Khile, Pyaar Kiye Jaa, Kanyadaan, Pyaar Ka Mausam, Trishul, Namak Halaal, Junoon, Utsav and others.